Inspection - Unity Tool Inc. Unity uses highly sophisticated inspection technology to ensure quality is always at the core of our work. Our motorized CMM features rotating and articulating probes, allowing inspection at all angles. Our touch-trigger probes measure discrete points, while the scanning capabilities acquire hundreds of surface points per second. Automated probe-tip changing systems also save time and money. Our advanced Vision system renders measurements using its high-tech camera, and creates SPC (Statistical Process Control) graphing for extremely accurate results. 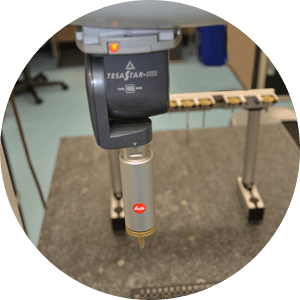 1 Brown & Sharp Global Classic 575 Coordinate Measuring Machine: X-19.69” (500mm), Y-27.56” (700mm), Z-19.69” (500mm) Scanning probe with motorized head. Auto probe changing. PCDIMIS and QC Calc for SPC output. 1 Numerex 1312-10” Mini Ver.II” Coordinate Measuring Machine: Travel X-12”, Y-13”, Z-10”, Renishaw touch Probe, Unit-touch and Uni-measure software. 1 Mitutoyo LSM503H Laser Micrometer: Measuring range .012-1.18”. 1 Scherr Tumico 14” Optical Comparator: Model 20-3500, Surface Illumination, Travel-X-7”, Y-4”, Quadra Check 2000 D.R.O., 10x and 20x lens. Variable gauging: OD Mics, Groove Mics, Thread Mics, Disc Mics, Indicator Mics, Blade Mics., Pin Mics, Depth Mics, Indicators, Bases, Stands, and Vernier Calipers. Hard Gauging: Thread Plugs, Thread Rings, Ring Master’s, 0”-12” set masters, .011-1.000” Gage Pins, V-Blocks, Angle Plates, Precision Riser Blocks.